The area between the southern slopes of Velebit and the city of Knin has extremely low population density, and the key element of the route is the D1 state road leading from Gračac to Knin. The railway line Zagreb – Split runs parallel to the road, but there are no other longitudinal communications, in particular no walking or hiking trails that would enable a simple tour of this long section. 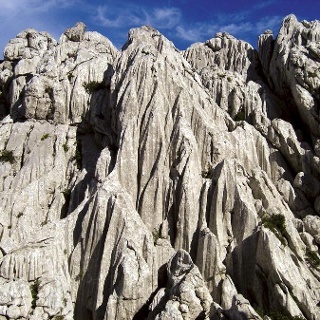 Mountaineers of Zagreb have recorded the GPS trace and thus electronically "marked" the southernmost area of Velebit (east of Crnopac); however, exploring this barely passable area can only be recommended to very experienced hikers. Therefore, we recommend cycling as the best way to cover the section 55 kilometers long from Gračac to Knin. Using the railway line can also offer an interesting experience in this section of the trail. Particularly interesting sites in this section are the source of the Zrmanja River and the mountain of Poštak. Zrmanja springs from a source below a steep rock, immediately flowing as a big and powerful river. From the northwestern side, Poštak is capturing attention with its shape of a rocky cone rising out of rocky karst ground. However, from the southwestern side, one can see pretty clearly that the mountain is elongated and without a pronounced peak. On many maps, this mountain is marked as Kečina kosa, but hikers typically refer to it as Poštak. The mountain got this name [stemming from the Croatian word pošta denoting post] back in the times when post was exchanged below the mountain on the border between Austria-Hungary and the Ottoman Empire. In addition to wide vistas that it offers, the mountain is also interesting in hiking terms due to a park of unusual natural sculptures at the base of its peek. There is only one access to the site – a pleasant and balanced ascent from the Zrmanja railway station, providing a nice opportunity for an excursion (two and a half hours of climbing). In the area north of Knin, one interesting area is the hilly terrain around the village of Oton, with beautiful views of the mountain of Dinara. Due to the comments of Lenka, I took the option of avoiding Oton and going via Radljevac (avoiding the road), Vještice, Pribudić to cross the river to Zrmanja Velo . From Knin to Zrmanja Velo, I walked 27 kilometers with the first half mainly on trails and the second half on gravel roads. I then followed more or less the GPS track of the Via Dinarica except direct from Zrmanja Velo to the gravel road that goes up to join the main road and I took a gravel road along the north slope of Oklinak summit. To join Gračac, I followed a track (OpenStreet Map map) that goes through fields between the road and the railway. They had not yet mowed the meadows and the path was overgrown with grasses. Water in Bender (between Radljevac and Vještice). Beautiful fountain in Zrmanja Velo by the roadside. No water then and no house. Road walking (not that busy road) plus some offroad as well. Čardak, Oklinak - quite ok, some logging activity so some parts of trail are bit difficult. No marked trail to Oklinak, but easy to hike on grassy hills. We slept close to the road (after trail joined the main road), there is some water (treatment needed). I recommend staying on road till Knin and not trying to hike via Otonski Gaj to Oton. There is very dense bush and we couldn't make our way through it.